When it comes to the Marvel Cinematic Universe — or the MCU to its fans — certain actors have put such a stamp on their characters that it's become almost impossible to separate the two. Looking back, Chris Hemsworth seems like the only actor who could take a godly character like Thor and make him seem human. Meanwhile, Chadwick Boseman's performance as Black Panther helped make a relatively unknown superhero into not just a household name, but a legitimate Oscar contender. And Robert Downey Jr.'s take on Tony Stark was the catalyst that made the entire MCU possible in the first place. So it's interesting to realize that one single casting choice not only would've had a major impact on the Marvel Cinematic Universe, but on the DC Extended Universe as well. That's because Jason Momoa — yes, the one who's playing major DC Comics character Aquaman — was nearly cast as Drax the Destroyer in 2014's Guardians of the Galaxy. 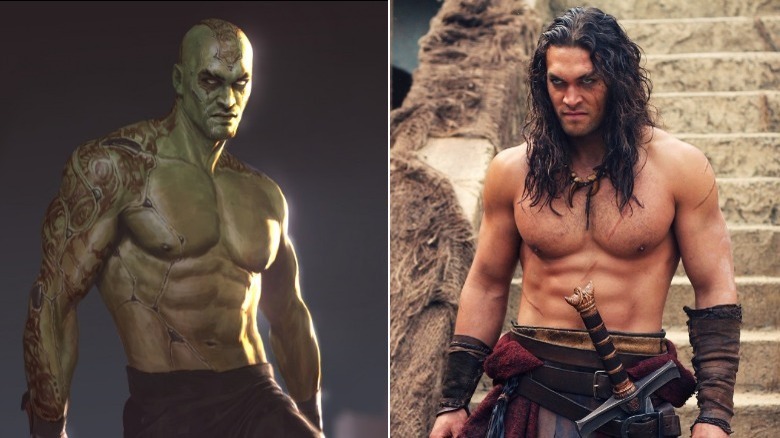 Charlie Wen — former head of visual development at Marvel Studios — sat for an exclusive interview with Looper to discuss the evolution of Drax's cinematic design, how Jason Momoa almost joined the MCU… and how the character nearly ended up looking like a very famous video game character. 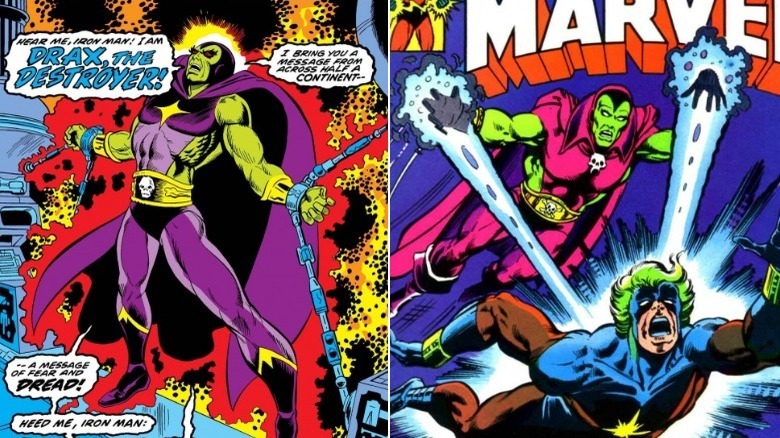 When describing the original 1973 comic book design for Drax the Destroyer (on the left in the image above), you might use terms like "simple," "distinct," and "extremely recognizable." You might also add the terms "unbearably ridiculous" and "monumentally goofy" to that list. The '70s were a different time, full of fashion choices parents try to explain away by saying things like, "look, my doctor thought that stuff was good for me." Overall, Drax's outfit when he first appeared in Iron Man is unforgettable… and also impossible to put on the big screen without causing the audience to barf into its popcorn. You might be surprised to see a guy calling himself "the destroyer" wearing a caped purple jumpsuit, but it makes some sense from a color standpoint. The incredible Hulk, after all, wears purple pants for a reason (besides hiding his hulked out privates): purple is a complementary color for green. The star on Drax's chest and the skull on his belt, meanwhile, say "cosmic death dealer" much better than the purple leotard ever could. Interestingly, not long after his comic book debut, Drax's design evolved to become even more ridiculous, with the addition of yet another skull at his neck — to really drive home that "destroyer" thing, probably — and a collared cape. Naturally, Wen and his team at Marvel Studios never got anywhere close to these looks when they began adapting Drax for the screen. 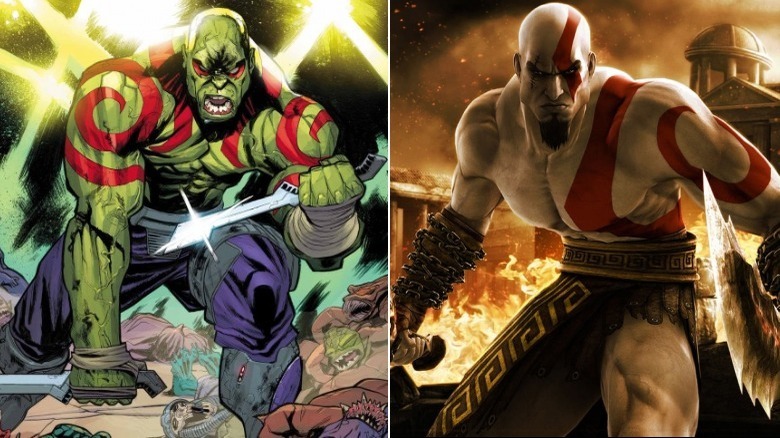 Before becoming the head of visual development at Marvel Studios, Charlie Wen also led a team at Sony designing Kratos, the murderous hero from the God of War video game franchise, which first debuted in March 2005 after a few years of development. Meanwhile, later that year, Marvel Comics happened to release a Drax the Destroyer miniseries with a brand new design for the character. Gone were the goofy purple tights and skull accessories. Instead, Drax ditched the shirt and got some ink. While the design was new to Drax, it definitely had more than a few similarities with Wen's final Kratos design — something he'd discovered when someone sent the company a Drax comic book. "I remember at Sony, we were like, "Oh man, what should we do about this?" Wen recalled. "They can't make it look — It looked so much like Kratos!" "How am I gonna make this character not look like the character I designed for God of War?" 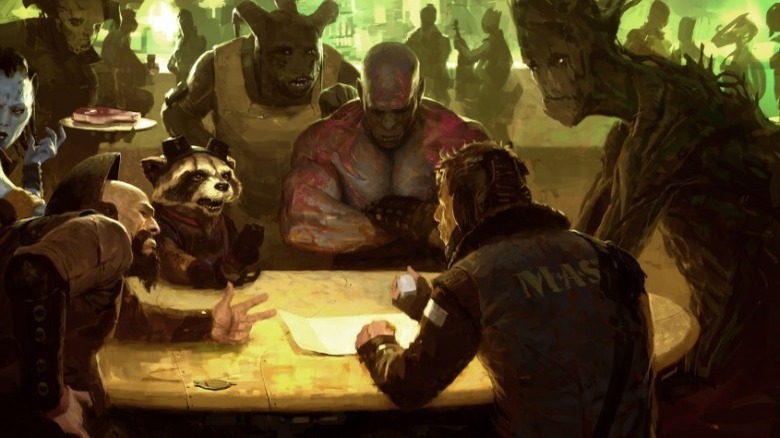 As Wen led his team through designs for Guardians of the Galaxy, the casting directors hunted for the right actors. One up-and-comer named Jason Momoa — who'd found success with his portrayal of Khal Drogo in HBO's Game of Thrones — became a frontrunner to win the part of Drax. "Jason Momoa sent in this amazing screen test, and of course he already knew how to do those fighting positions," recalled Wen. "He looked very convincing." Wen created art depicting the actor in the role, featuring the Momoa's face on a lean-looking Drax the Destroyer that's a clear step away from the Kratos-looking comics and much closer to the final cinematic design. 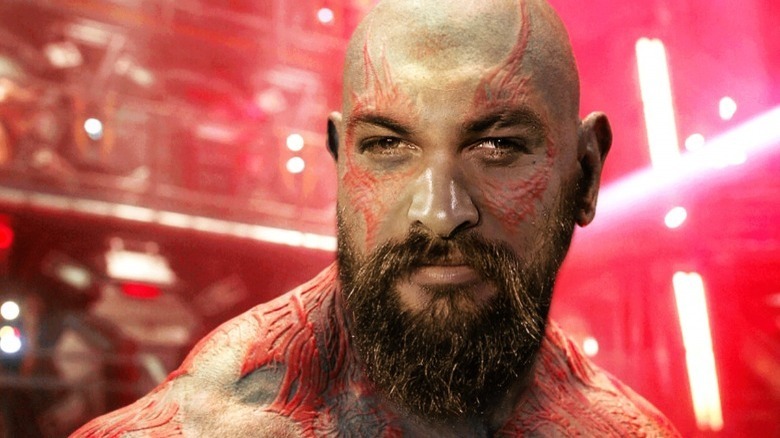 As it turned out, however, while Momoa had the look and the moves to play Drax, he wasn't quite right for the part — at least not when compared with another actor vying for the role, wrestler Dave Bautista. "I think with Momoa in it, it felt like the Game of Thrones character that he played. He has a great face for it," noted Wen. "We did some takes with Momoa as the character, as Drax, but ultimately I think Bautista really took that role." Will the real Drax please step forward? Momoa seemed to agree that his casting wouldn't bring anything new to the screen. "I want my children to see their father happy. It's not that it's not a good role, it just wasn't the right thing," he said in a 2014 Zap2It interview (via IGN). "I was on Stargate: Atlantis for four years playing a similar character called Ronon, who was an alien who didn't say much and grunted. I've been there and done that, whether people have seen it or not. You want to stretch." Of course, no one could know in 2014 that Momoa would go on to headline his own superhero movie a few years later with 2018's Aquaman, one of the tentpole films of the DC Extended Universe — but that's another story. Anyway, Momoa was out, Bautista was in, and both Wen and Marvel fans would agree that the right man was cast. "Bautista brought this — a different side to it that nobody was expecting," Wen said. "A little funny, but naturally funny. It was like, 'Wow, this is a whole character. He's bringing something to that character.'" "From that point on, too, [...] we designed it specifically for him — even the way his head is shaped." 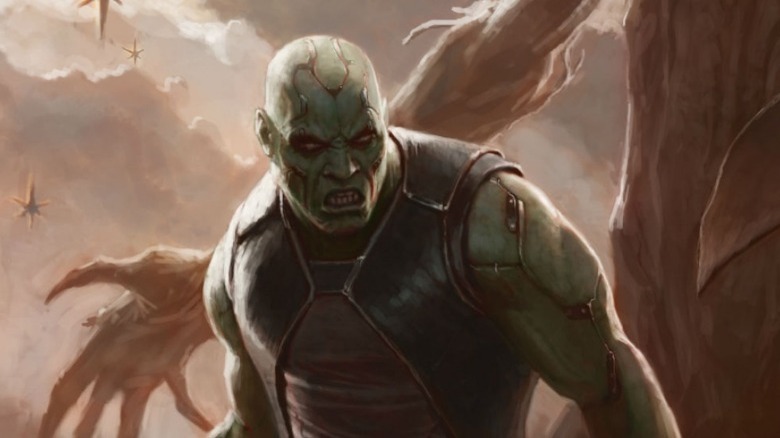 The image above — one of the first pieces of concept art Kevin Feige unveiled to announce Guardians of the Galaxy — shows the influence of Bautista on the character's design. Meanwhile, to further evolve Drax's cinematic look, Wen continued pushing the design away from the clean lines of the mid-2000s Drax — the one that looked so much like Kratos. Instead, he focused on making Drax's tattoos an integral part of the adapted character's internal life. Even the art resembling Momoa was heading in this direction, and Bautista's casting kept the momentum moving forward as well. "All the tattoos that went on him is really telling about his story," said Wen. "His life is basically on his body." It's easy to see in the image above that also features early versions of the other Guardians that the tattoos are beginning to feature even more prominently in Drax's design — and his intimidation factor. "Everybody's afraid of him. He's somebody that even people in prison are afraid of," said Wen. "This is an intergalactic prison, where you have all these huge characters that would, I don't know, just look really scary and monstrous. But Drax is somebody that can definitely hold his own to any of them."